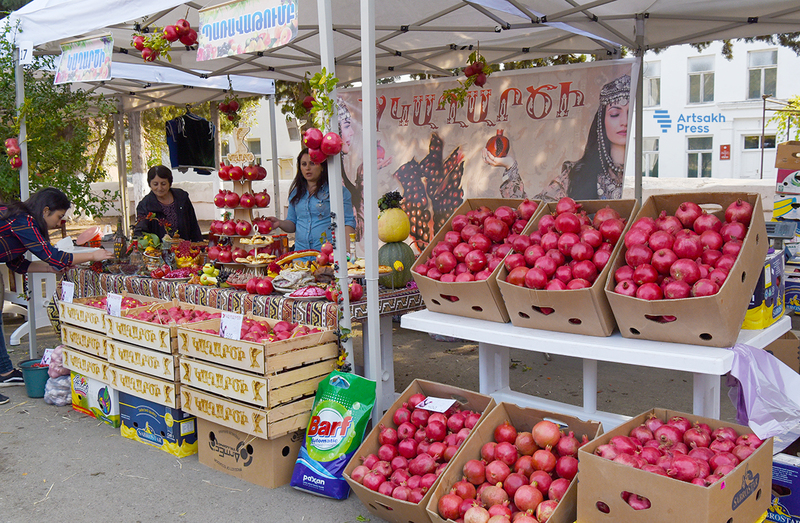 On October 21, the second pomegranate festival was held in Martuni, Artsakh Republic. STEPANAKERT, OCTOBER 21, ARTSAKHPRESS: About 90 pavilions was formed at the festival, where representatives of Martuni and other regions presented their product. Blessing ceremony was held by Primate of the Artsakh Diocese of the Armenian Apostolic Church Archbishop Pargev Martirosyan. President Bako Sahakyan accompanied by other officials attended the pomegranate festival. President Sahakyan noted with satisfaction that the festival became traditional, walked along the pavilions, got introduced with the products, talked with the participants on diverse issues. In an interview with Artsakhpress,, the Minister of Agriculture of the Republic of Artsakh, Jirayr Mirzoyan, said that as compared to last year this year the number of participants and pavilions has increased significantly. Pomegranate gardens have been established in 5 regions of the republic: Askeran, Hadrut, Martakert, Martuni and Kashatagh, but the majority of them are in Askeran and Martuni regions. As compared to last year, the number of pomegranate orchards increased by about 100 hectares this year. At present, we have about 1360 hectares of orchards. At present the harvest makes 350 hectares. about 1000 tones of harvest have been gathered, "Zh. Mirzoyan said. According to the Minister of Agriculture, there is a demand for pomegranate both in Artsakh and abroad. Martuni Mayor Mher Khachatryan noted that in 2017 the City Hall set up the organization of pomegranate festival for the first time. "This year the festival was included in the framework of the annual regional events program and was implemented under the patronage of Martuni regional administration. Compared to 55 pavilions presented last year, the number of pavilions has increased twice this year, making the event even more colorful, "he said. Khachatryan. He noted that the pomegranate is a symbol of Martuni, as the climatic conditions and geographical position are more favorable for growing the fruit. Regional ensembles of Martuni, Martakert, Askeran, Hadrout, Shahumyan and Shushi performed at the festival. The event was attended by Artsakh State Minister Grigory Martirosyan, other officials, guests and others.